This Xtra-Large Emerald Air Fryer provides an easy and healthy way of preparing your favorite ingredients. The Emerald Air Fryer provides an easy and healthy way of preparing your favorite ingredients. By using hot rapid air circulation, it is able to make numerous dishes and tasty delicacies. We’ve gathered Emerald Air Fryer reviews that show functionality and advantages of four prominent models of this manufacturer. Hot air circulation technology allows cooking food with little to no oil, which is a great way to enjoy healthy dishes. Taking into consideration the capacity, functionality, and quality of these items, we’ve chosen the most credible option – Emerald 1804 Air Fryer with LED touch display. The brand Emerald are offering a diverse range of products when it comes to mini deep fryer products. They are offering 3 different types of Air Fryer with slight variations on each one in terms of price and features. This is great, but how are you supposed to know which is the best hot air fryer for you? Which is the one that’s going to please you and whoever you are cooking for? We are going to provide you with a succinct and easy to read rundown of each of these models, explaining what makes these products some of the most exciting on the market, and the aspects that let them down as well. 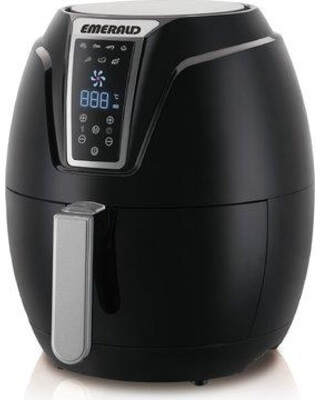 This way you will get a great idea of the Air Fryer that’s going to help you in the kitchen, help you to change your life and diet for the better, and what Air Fryer is not going to be the right one for you. Ready? Let’s go! 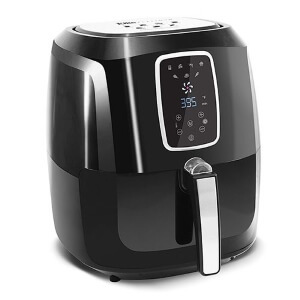 The first model that is up for review is the 5.2L capacity Air Fryer with LED touch-screen display. The largest capacity of all the ones on offer from the Emerald brand, you are getting a whole lot of space. You also get to use a nifty touch screen display in order to cook your meals, and this even has presets for your favourite foods that just require you to click one button to get it started. The size of this Air Fryer ensures that it is perfect for those cooking for more than 3 people. The detachable basket allows you to have a quick and easy transition from cooking your favourite food to serving it, and it also makes cleaning the separate parts of your fryer very easy. With its automatic shut off function, you’ll never have to worry about overcooking anything. Some might say that the 1800 Watt power behind the circulation fan is not enough for a fryer of this capacity. Many people expressed that they weren’t able to get any help and support with their fryers that were problematic. This model is a little bit smaller than the last one, and can only hold 3.2 litres worth of food whilst maintaining a balanced cooking experience. But with a 1400 Watt power behind all of its cooking endeavours, as well as a reasonable pricing of around $70, this could be the answer if you are looking for a smaller Air Fryer that still packs a punch. As mentioned, the 1400 Watt power that is behind the Air Circulation technology is more than enough to cook anything that you put in there to perfection. It’s always better to have more than enough power than less than enough, and this Fryer knows it! It comes with built in presets, so you don’t need to worry about messing up your favourite dishes. Simply click a button, sit back and get ready to enjoy! Due to its powerful fan, it can cook near enough anything! From chicken and chips, to vegetables and tempura prawns! You have to watch how you use the basket. Some customers have said that the basket has nearly slipped away from the handle, causing them to nearly get a face full of extremely hot food. This is Emerald’s model that doesn’t utilise a 1400 Watt fan, instead it is best suited to probably one or two people at the most. 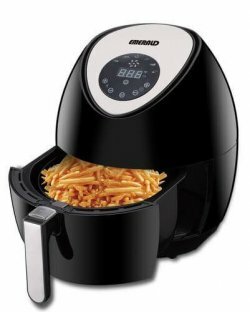 But we still have a lot of the features that make Emerald brand Air Fryers a fantastic purchase to make. 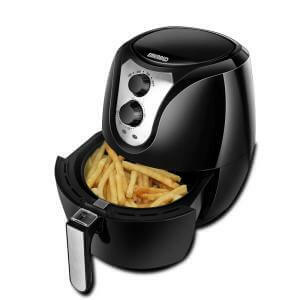 Its simple design makes it an easy Air Fryer to clean after it gets a little bit dirty. It’s smart timer technology not only shuts if off when times up but also resumes cooking if you lift it up in the middle of a cook. The sleek and modern design is perfect in any kitchen and it doesn’t take up too much space either. Some customers have commented saying that the wiring in this fryer is often faulty, one unfortunate person saying it actually caught on fire after they used it. The normal wattage on this Fryer doesn’t make it the best or most powerful model around. Here we have the last (but by no means least) model from Emerald. This one is almost identical to the second one in our list, except for one detail. This model as a state-of-the-art LED touch screen for added accessibility. All of the features of the other models are present: the timer, the presets, the dishwasher safe basket, everything! The LED touch screen control display allows for ease-of-use and makes the Air Fryer that much easier to clean when it gets a bit dirty. The almost spherical design of this Fryer is really sleek and attractive, making it a fine addition to any kitchen it may find itself in. It has the 1400 Watt power behind it, which gives more than enough heat to cook your favourite foods. Some believe that the LED display is a bit too confusing and that a regular analogue display is much better when dealing with a kitchen appliance. It is made of plastic which isn’t everyone’s favourite material when it comes to something that’s going to heat up. So, we’ve made it through the various models that Emerald have to offer you. In terms of size, the 5.2l capacity model outshines the others tenfold. But if you’re looking for something a little smaller, you may want to take another look at the models we have listed here. The best suggestion would be to go with those that have the 1400 Watt power behind them, as you can ensure that everything you put into your fryer will have a better chance of cooking. Have a little read through again, and see if one jumps out at you as being the product of your dreams.